Maybe you, like me, are a bit of a plant nut – I don’t mean knowing the full-on glossary of Latin terms for each and every plant – but I mean endlessly captivated by the beauty, or elegance, or magical quality, or exquisite detail on display, year after year, season after season, in the world of flowers, plants and trees. It always causes the design ‘twinge’ in me come spring, as it all unfolds yet again and one witnesses the beauty and theatre on display. And being of the ‘artist’ leaning I always see more each time I stop and look. Inspiration never dries up, the abundance of nature always causes new creative impulses and ideas. 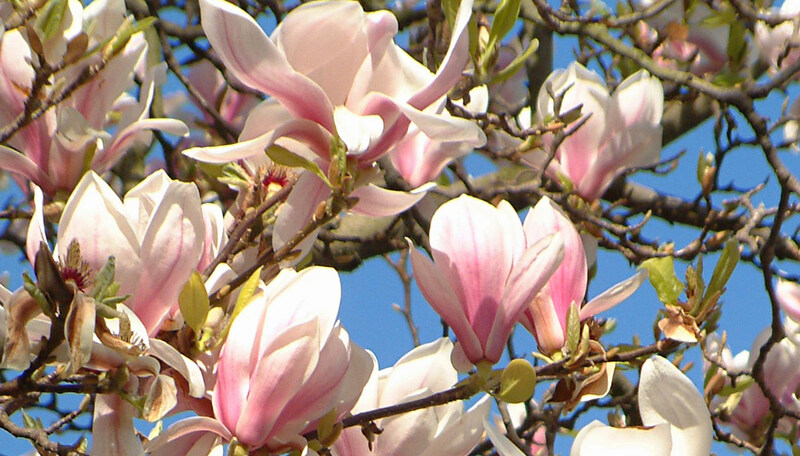 So it is, every year, when magnolia trees come into bud and flower, their large majestic flowers unfurling into the cup-like open globes of soft blush pink petals. 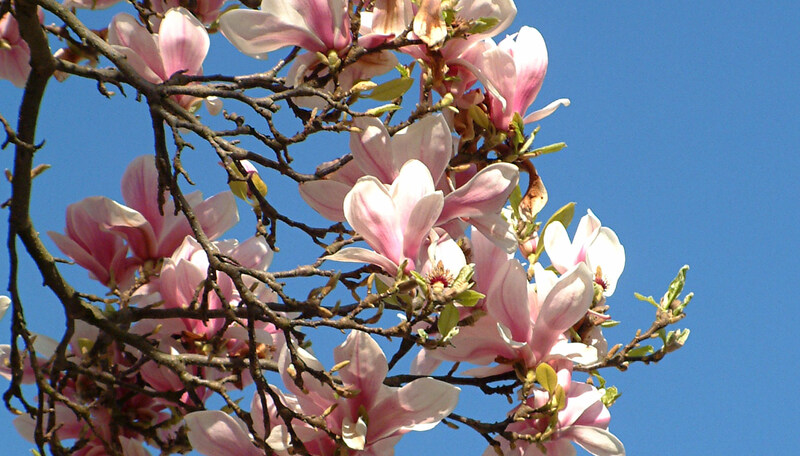 I have always loved magnolias against those sharp blue spring skies we get on sunny clear days – and there have been several this year – where the flowers are silhouetted against this wonderful colour, which enhances the blush on the large petals and their elegant outline. 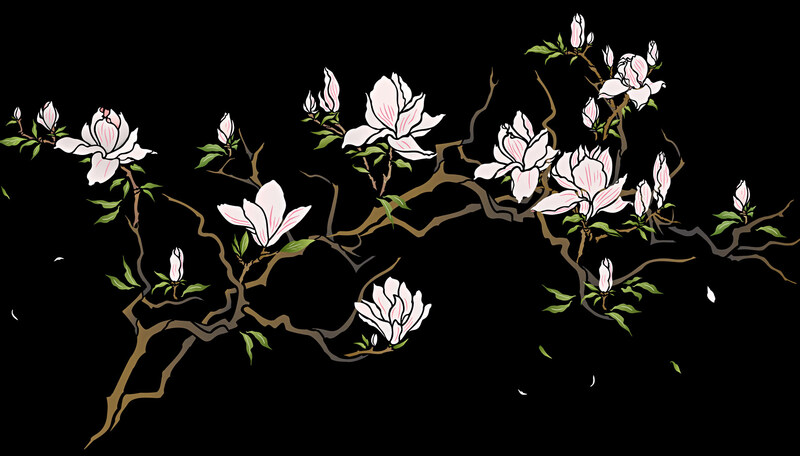 Well, flowering magnolias seem to cause that same design inspiration flush every spring, and this year, as the new website was taking shape, I thought ‘what better way to launch the site than with a new magnolia tree stencil?’ One that could be adapted to fit into plenty of decorative scenarios for all those avid and starter stencillers out there alike. 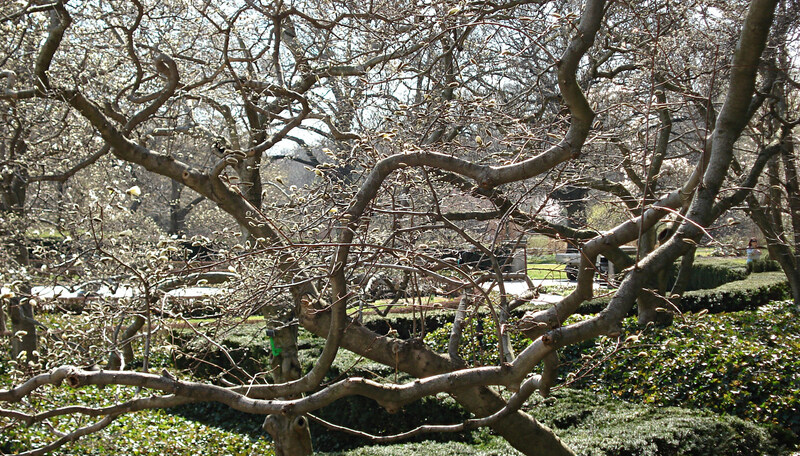 And of course, there is the wonderful way that the magnolia tree grows, with its beautiful gnarly, twisted branches, a woody tracery going off at this angle and that angle, on which the large goblet-like flowers sit. 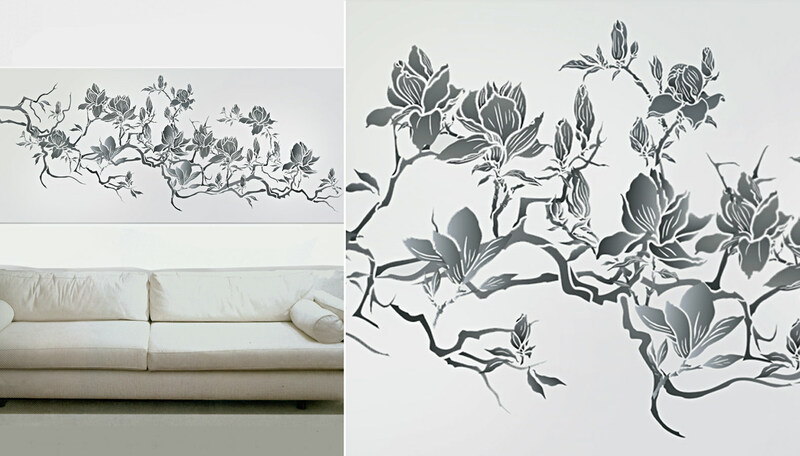 Wonderful adapted for interior design stencils, for all interior spaces, as the design can so easily be positioned to fit into wide landscape areas, or narrow portrait areas, or large or small spaces. 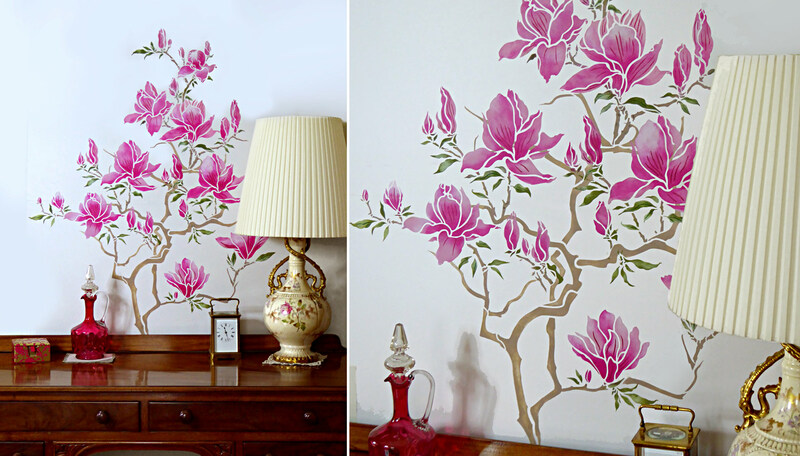 The new Flowering Magnolia Tree Stencil is great in formal, traditional settings, simple country rooms, or in pared back contemporary interiors. Working in graphic monochrome palettes gives a more structured feel and creates modern simplicity and silhouette style (above), whereas using the range of blush pinks, woody tones and greens, brings out the natural flowering botanical element of the design (below). 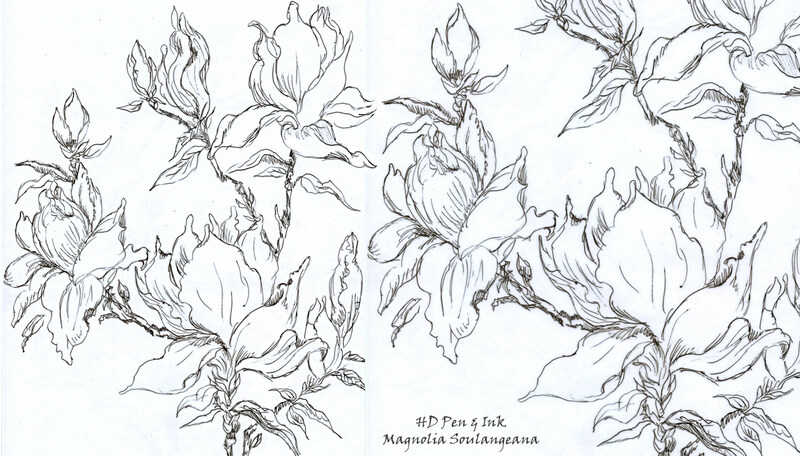 And with magnolias, not only are they wonderful design shapes, just waiting to leap off the page (or wall! 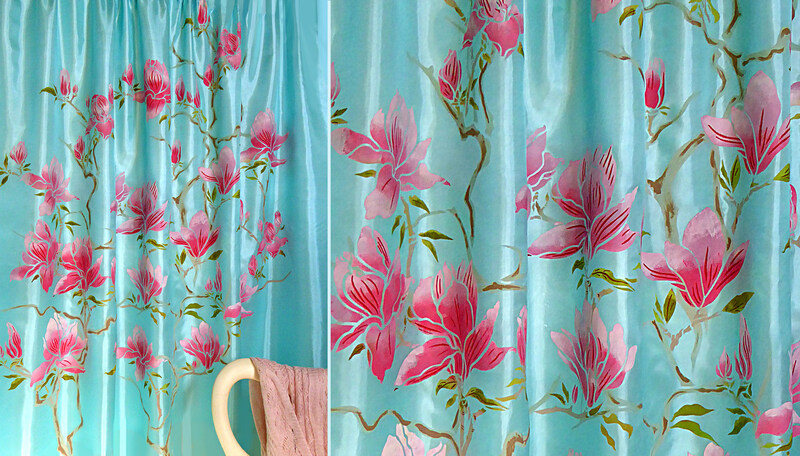 ), but there is this wonderful cross-over between ‘floral botanical and ‘floral oriental’. So this theme pack, with its large beautiful flowers and gnarly tree motifs, makes a great Chinoiserie style design and the colours and layouts used can bring out either the botanical or oriental nature of the design. 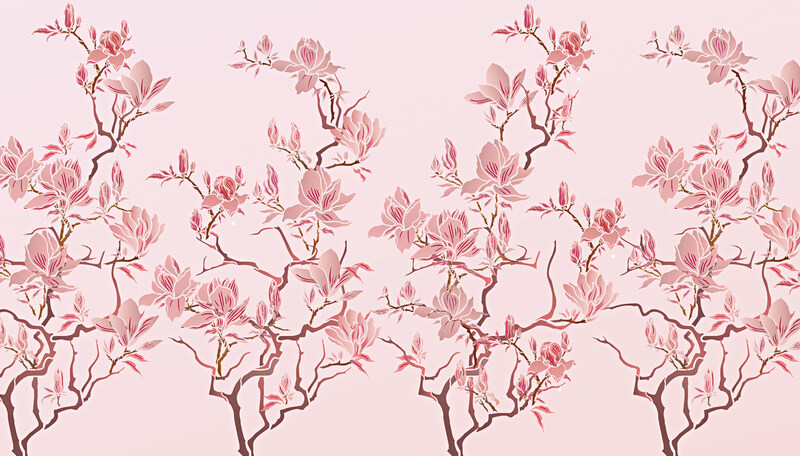 The twiggy tree motifs create the perfect backdrop to place the magnolia blooms and buds on and can be repeated in regular or random fashion. Repeating the flower motifs at irregular, random intervals increases the continuous feeling of tree like growth, even on a regularly repeated base of tree motifs. 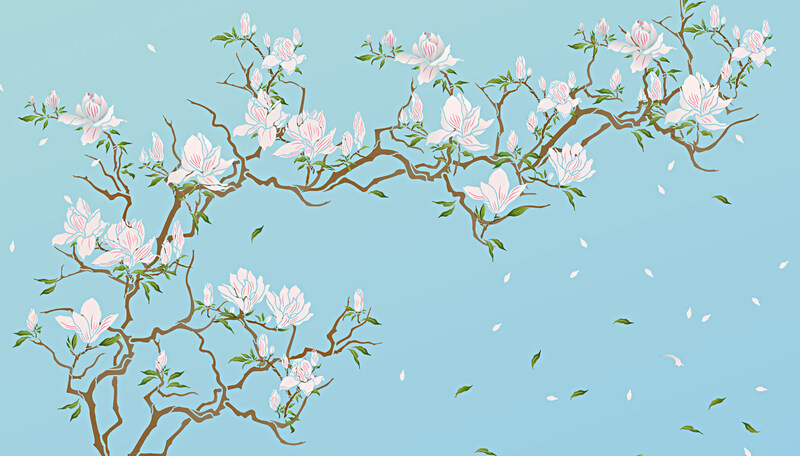 The Flowering Magnolia Tree Stencil theme pack is fantastic used to create beautiful Chinoiserie silks or impressive Chinoiserie wall features. Beautiful in pale plaster pink and chocolate, repeated magnolia trees with flowers placed in random arrangements. As usual I start out with various studies and sketches, which is really just like getting to know someone – becoming more closely acquainted! It may be a little traditional, in this day and age, but observational work, really is at the core of good design, or design that rings true to the subject. So, it is always good to get out pencils, pen and ink and other drawing media, to build up a little knowledge about the next design star!! 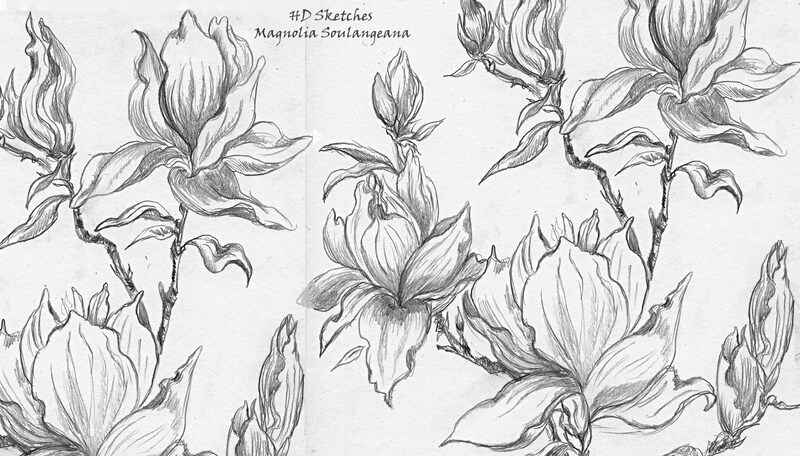 I spend as much time on preliminary sketches, as necessary, working in different styles – quick sketches, longer drawings, different angles, different flower groupings and even different types of the same flower to see which seems to be more suggesting of a stencil design and likely to be the most versatile in different decorative settings and which might have the widest appeal. Once several sketches have been done, if there is the time, I spend a little longer on a more detailed tonal drawing, which is usually where the style starts to emerge of the design – its character, its rhythm – and it is often from these drawings that I base the stencil designs on. 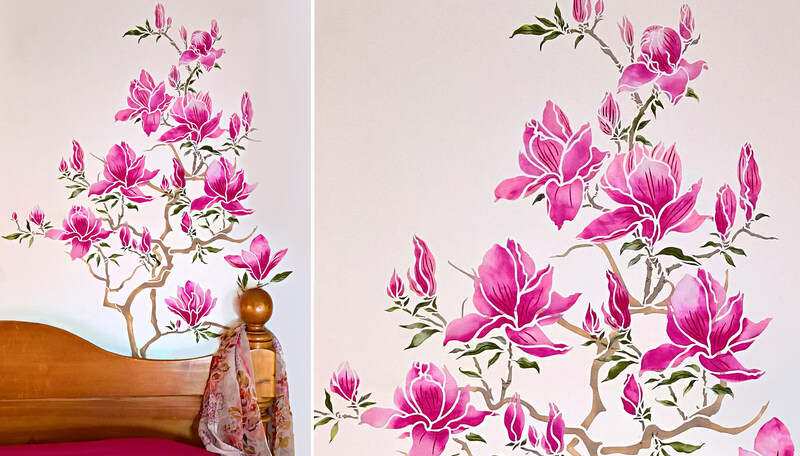 The Flowering Magnolia Tree Stencil is charming in this country cottage bedroom – a soft rendition in pinks and reds. 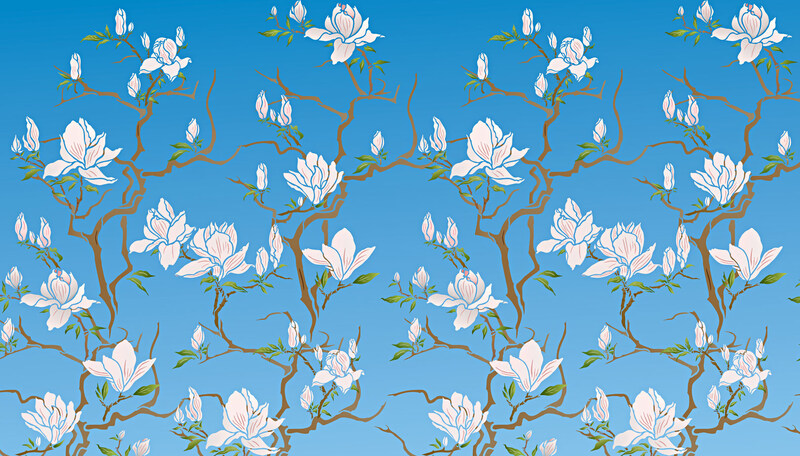 Magnolias against a spring blue sky with the sweet bird motifs of the Humming Birds Stencil. A rich deep azure background would also work here, for this springtime mural. 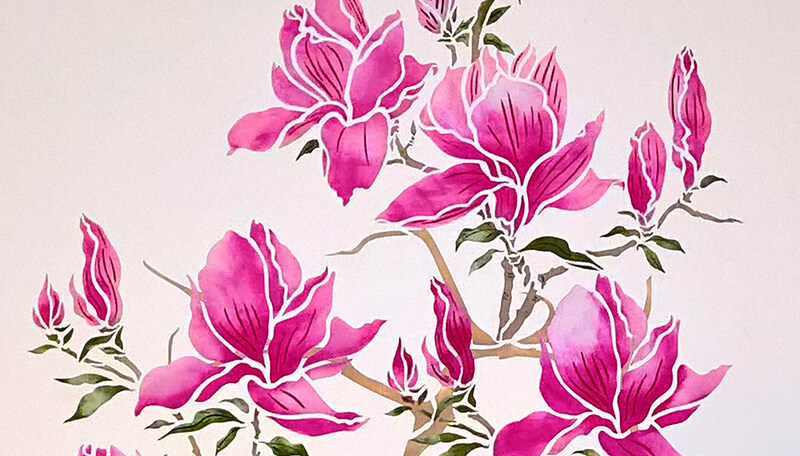 Working on deep, deep green, ink blue or black backgrounds with the Flowering Magnolia Tree Stencil will create an instant lacquer effect, especially with a coat of gloss varnish to follow. 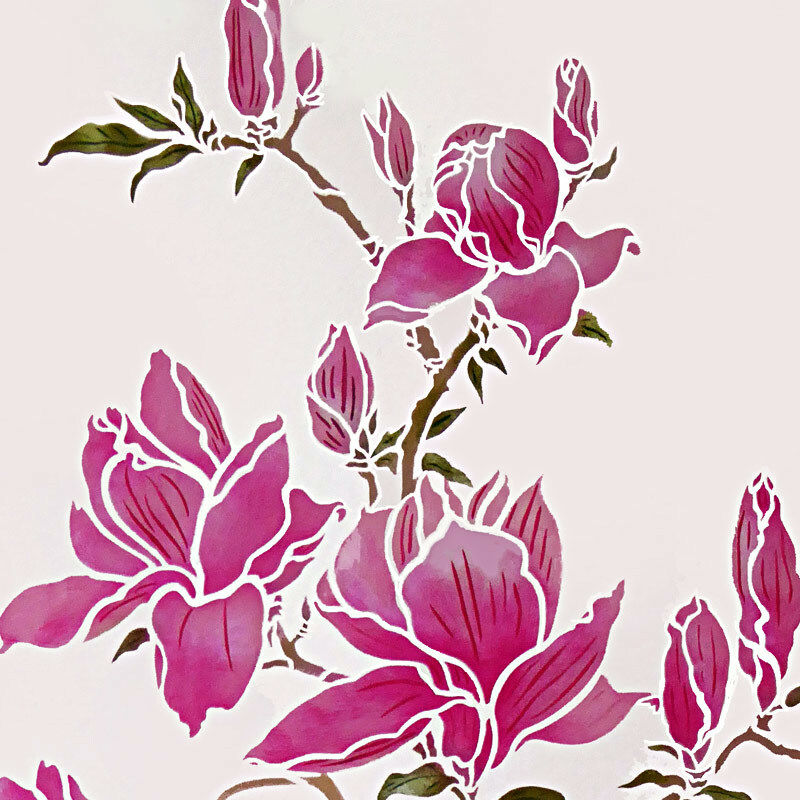 The magnolia flower shapes again leaning towards a modern update on classical oriental or Chinoiserie design. 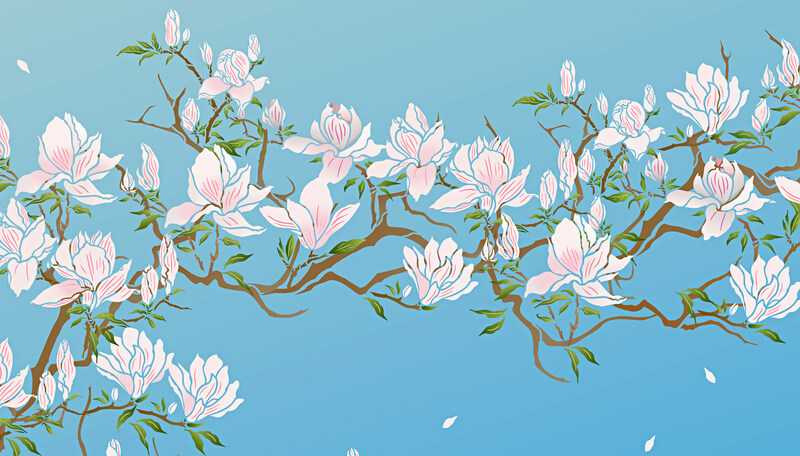 This theme pack is great – it can be applied with the flowers in a profuse display, stencilled closely together (as above), which creates the effect of real magnolias on a tree, that grow in thick abundance. 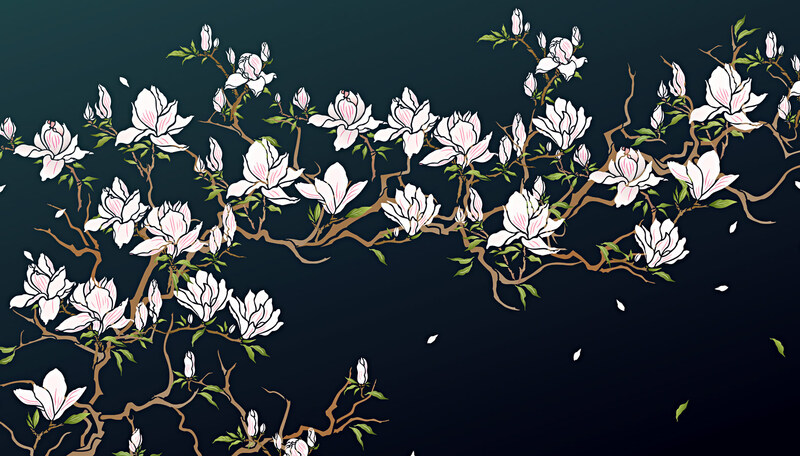 Or try (as here) the flowers spaced more sparsely, showing more of the delicate twig shapes beneath. Add a few flower petals and leaves floating mid space to give the effect of a gusty spring breeze blowing blossom about, as it does at this time of year. This seems to be where theme packs come into their own, plenty of motifs and thereby choices, of how to place them and how to combine them for many different decorative settings. 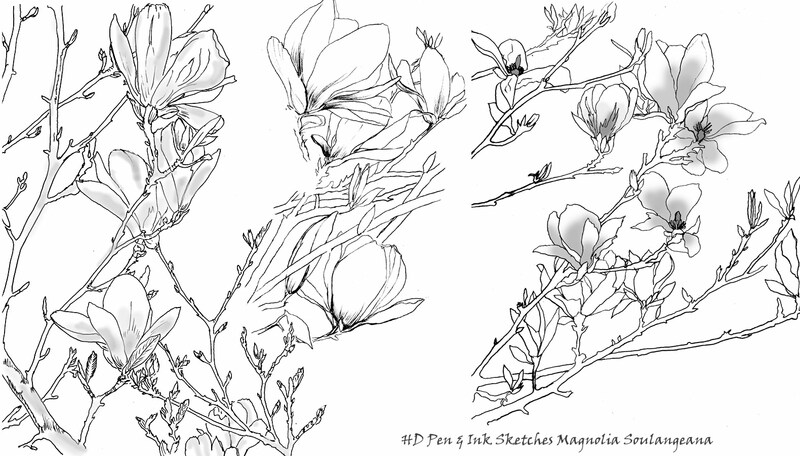 Amidst inspiring flowering magnolia trees, a little gadding about and squinting in the sunshine. 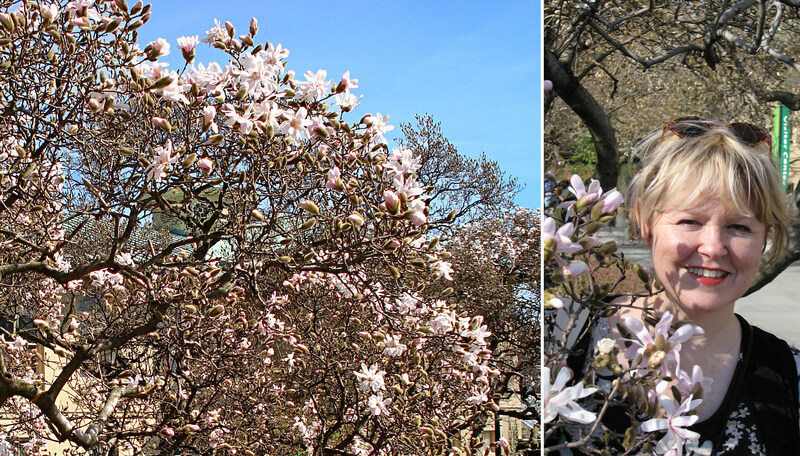 It was 70 degrees on a New York March Spring day – like mid-summer here! And in Brooklyn Botanic Gardens, we were full of wonder at the profuse display of soft pink flowers against a clear blue sky. Quite wonderful! 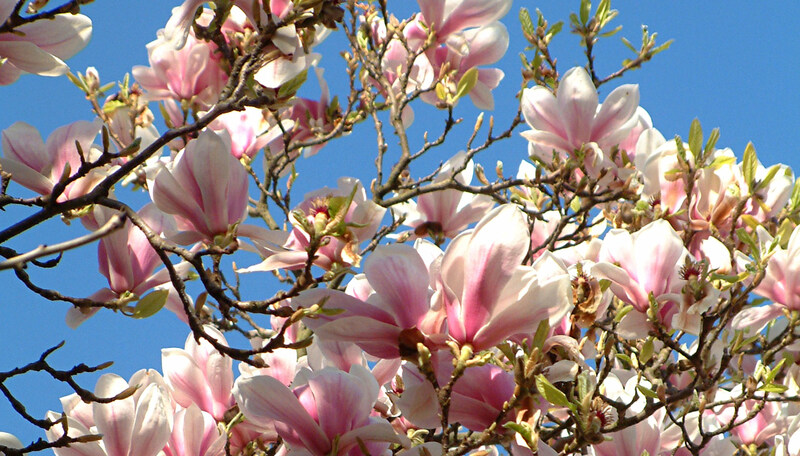 At my last house – we were lucky enough to have this beautiful magnolia tree in our back garden – again the beautiful pink and blue on a crisp sunny Spring morning. And today in London!!! 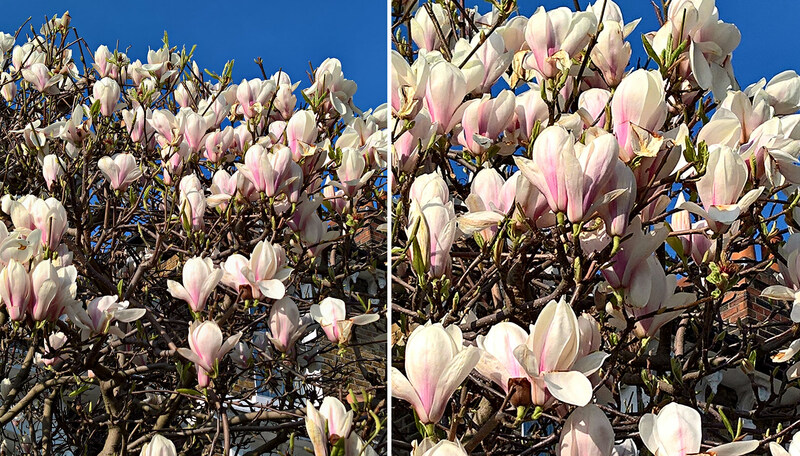 On the very day I have been writing this magnolia blog, out walking the dog on a sunny Spring day in North London, this stunning magnolia tree and breath-taking blue March sky come into view. Smart phone to the ready! Beauty all around! Hope you enjoy the stencil! Do you do commissions please? In some instances, yes. What was your particular interest?